Since its founding, Washington, DC has reflected the regional cultures brought to the city by waves of new residents from around the country. Join us as we trace those regional cultures and the impact they have had on life in Washington. 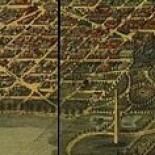 This entry was posted on January 19, 2016 by dchistorystuff in City of Washington, DC History, District of Columbia population, Early Washington DC, Early Washington history, Georgetown, History, Irish Washington, Planning, Urban development, Washington DC, Washington DC population and tagged D.C., District of Columbia, Foggy Bottom, Washington DC, Washington DC history.